This item may be personalized. Message me with questions! 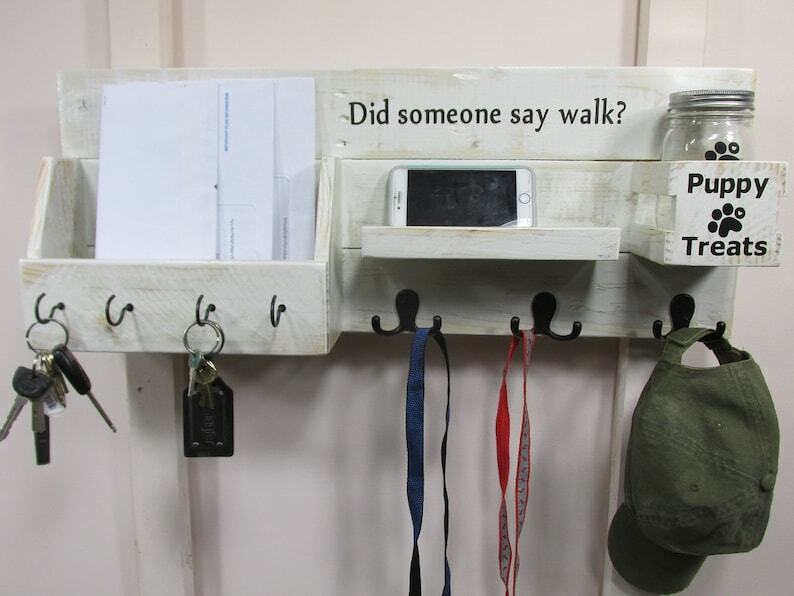 This dog leash holder offers that much needed entryway wall storage as a wood leash holder and with that extra space for your keys, your mail and other personal storage. A dog lovers gift and a mason jar organizer with treats. This rustic dog leash hanger or handy key hook gives that extra place for wall storage. This item is custom built from reclaimed pallets and industrial crating. The pallets and crates are disassembled by hand in order to reclaim as much of the wood as possible. Nail holes, knots and imperfections in the wood help give it the natural charm of reclaimed wood. each item is made individually and no two are alike. some have nail holes or knots while others do not. its all about the wood. This was a great gift for my sister and her dog.